This hack introduces Stakeholder Enrichment as a theory and practical application designed to advance Capitalism by rebooting the underlying motivators of self-interest and creating more evolved corporate cultures. Organizations that prioritize enrichment of all stakeholders achieve authentic engagement and maximize long-term, sustainable returns. In addition Stakeholder Enrichment promotes patient, principled and socially responsible values and bridges gaps between employee/employer, fiscal/social responsibilities and survival/self-actualization1. Appendix A documents a highly successful application of this theory by a team of Accounting Analysts in a large financial institution. The project produced a significant increase in team and individual engagement within a six-month period. Stakeholder Enrichment is a modular process that can be applied at any level, (individual, team, department, corporation, and/or country). Enrichment: 1) to make rich or richer especially by the addition or increase of some desirable attribute or ingredient, 2) to make fuller, more meaningful or more rewarding. 3. Promote values that are patient, principled and socially accountable. 1. Create a vision statement based on the organization’s highest purpose, which encompasses both the fiscal and social missions of the company. 2. Develop a “higher purpose project” which gives form to the vision and a way for all stakeholders to actively engage. 3. Communicate S.E. principles with existing top-down engagement efforts to create an enriching and engaging work environment. Since November 2008 global financial turmoil has presented us with an increasingly urgent call for the evolution of our economic systems. Individuals have lost hope and vision along with their retirement funds, and in many cases, their homes or businesses. Some corporate leaders, and corporate cultures, displayed short-sighted disregard for clients, employees, communities, and investors and the consequences reverberated around the globe. Corporate employees fear the possibility of being laid off while companies are frustrated by the lack of employee engagement. Any system that does not work for the benefit of all is not ultimately sustainable, as in the example of a human body where only the head is tended, but the rest of the body is neglected. The body may survive, but it will not thrive. Full potential cannot be achieved when it is at the expense of essential parts of an integrated system. Capitalism provides independent ownership and the freedom to make choices based on self-interest. Competition is infused into every level of our economic system, which is based on the duality of winners and losers, on survival of the fittest. Self-interest appears opposed to other-interest. We do not reach our highest potential as human beings, or organizations, when we are in survival mode. Moving beyond survival we are capable of identifying and meeting a variety of other needs and desires. Fully evolved, we may reach the level of self-actualization where humans are motivated by purpose, meaning, fulfillment and a desire to achieve ones full potential. It is at the level of self-actualization that we are capable of our greatest achievements and best performance. In Stakeholder Enrichment Theory, linking all stakeholders of an organization to a common higher purpose inspires corporate cultures rooted in the desire to self-actualize. Although competition and self-interest are maintained, there is recognition that if a body is in competition with itself, it is a compromised system. The health of each part of the corporate body is essential to the success of the whole. Self-interest and other-interest can be directly related. Our organizations have structures and systems in place that indicate strong left-brain capabilities, such as logic, analysis and financial measurement. Although left-brain skills are essential to success, how can we enhance our corporate right-brain skills, such as creativity, innovation, and the ability to create relationships? What are the structures needed to form the essential connections between the polarizing dualities of right and left, whether in a brain, organization or political system? Stakeholder Enrichment creates a link that connects and transcends those dualities and activates the full potential of the system. As we move through the next Age, which some refer to as the Innovation Age, or Knowledge Age, strong right-brain qualities and the integration of logic and creativity become increasingly more important. As the pace of change accelerates, rigid structure may not be as highly valued as innovative adaptability. In fact, we can lead an employee to engagement, but we cannot make him or her engage. To be genuine and effective, engagement must be an invitation based on a mutually beneficial relationship, not a directive, strategy or manipulation. b. The benefits of being job-engaged are not clearly communicated to employees and most are unaware of the impact it can have on their health, relationships and quality of life. c. Engagement is a two-way street. No one can make the other party engage. It’s an invitation to which the employee can say yes or no, once provided with enough information to understand what’s being offered and what’s at stake. See Appendix B for a Brief History of Work which illustrates why employee engagement is so challenging and how to help “flip the engagement switch” within the employee. Creating a Vision Statement based on Stakeholder Enrichment, and putting the principles in action, is an expression of corporate self-actualization. For instance, a bank doesn’t just manage investments, lend money and administer trusts; it helps clients achieve their dreams of home ownership, business expansion, retirement, and philanthropy. To provide a brief example of the vision portion of the S.E. process, imagine that “Bank A” wants the substantial corporate benefits derived from an authentically engaged workforce and believes this will facilitate both the short and long-term profitability of the company and its stakeholders. “To enrich the lives and empower the dreams of our clients, stockholders, employees and community”. Community by supporting its dreams of health, education, and opportunity. Putting the principles of SE into action, the company designs a project or campaign to actively connect stakeholders to the unifying vision, in this case empowering dreams. Bank A may choose to develop an internal program that begins with employees voluntary involvement, and over the course of the first year, invites additional groups of stakeholders to participate. A more detailed description of this process is available in Appendix C.
As an alternative, Bank A may choose to partner with an existing global campaign that is consistent with their vision statement. In this example, stakeholders could be invited to participate in the Million Dreams Campaign3, an existing platform and social networking site founded by Marcia Wieder. Participation in the Campaign would connect stakeholders to the corporate vision, engage employees by encouraging both personal and professional dreams, and integrate the principles of Stakeholder Enrichment into the corporate culture. 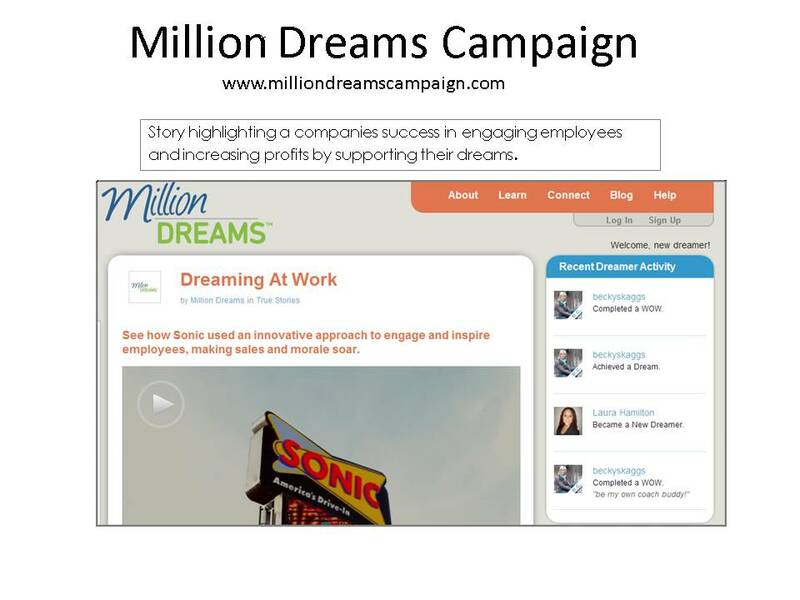 See Appendix D for additional information about Million Dreams Campaign and other possible partnerships. Enrichment is the process of adding or increasing some desirable attribute or ingredient, or to make something fuller, more meaningful or more rewarding. Enrichment is done for the benefit of the other and is often the quickest path to mutual engagement. It’s like providing nutrients to create fertile ground for a plant or crop to grow. The plant grows (i.e. engages) in relation to the richness of the soil. In an economy where raises and promotions are limited, enriching employees is essential. See employees as individuals with hopes, dreams and agendas of their own. Respect them for their unique contributions. Know the employee by discovering their strengths, interests and unique talents. Grow them by providing opportunities to expresses their passions and talents. In short: See and respect. Know and grow. In one word: connection. The relationship with an employee’s direct manager has the greatest impact on engagement. Enrichment is a powerful way of building strong relationships. The average U.S. employee works 91,000 hours in his lifetime4. If the employee is engaged in his work, there are benefits in the areas of health, relationship and quality of life. The consequence of not being engaged can be the difference between surviving the 91,000 hours, and thriving. It is essential to communicate the benefit of engagement to employees and include them in the process of defining and creating mutual engagement. Only with this level of transparency can the employee make an informed choice about his actions regarding engagement. If the employee truly understands engagement, its personal benefits and ways they can take part in the process of creating more of it for themselves, it may become clear to the employee that they are thirsty for engagement and gives them autonomy and responsibility to act. If an organization attempts to engage its employees solely for the benefit of the organization their efforts will be perceived as a way to manipulate employees into giving more for less. For the employee to be engaged with the company, the company must be equally engaged with the employee. Stakeholder Enrichment is designed to inspire an evolved model of capitalism that is still firmly based in self-interest yet encourages the pursuit of a larger, long-term return above a smaller return and shortsighted, temporary gratification. This long-term focus for a larger return is illustrated by the “Marshmallow experiments5” where young children were given a second marshmallow if they could wait 15 minutes before eating the first. They could settle for one quick marshmallow, or with a little self-discipline, achieve a 100% marshmallow return. Either choice is based on self-interest; it’s only the motivation underlying the self-interest that is different. The study showed that children with the ability to delay gratification were more successful as adults. For individuals and businesses, a desire to fulfill their purpose and find meaning creates the motivation and self-discipline needed to delay gratification. Enriching our employees and community is a little like choosing not to eat the first marshmallow right away. Strategically investing time and money to create a connected, enriched, workforce produces a powerful, long-term and self-sustaining system. A Stakeholder Enrichment metric, which companies can produce, publicize and promote, could spotlight those companies that add value to all stakeholders, indicating their long-term viability and profitability. Combining financial metrics such as return on investment with Corporate Social Responsibility ratings could produce a single Stakeholder Enrichment metric that indicates the value added by an organization to all essential parts of the corporate “body”. This metric would be voluntary, as participation in the Corporate Social Responsibility program is now. The S.E. metric would clearly show whether an organization’s resources are being exhausted in an effort to maximize short-term profit, or enriched in an effort to provide sustainable and growing returns. Socially responsible investment funds provide a context for the development of this metric. Stakeholder Enrichment can create self-actualized companies and innovative, engaged people capable of achieving their full potential. Capitalism will evolve as corporate cultures shift with the recognition that enriching the whole body leads to peak performance. Although we may still be mired in the challenges of Capitalism 1.0, there is growing interest in exploring uncharted territory, as evidenced by sites like Management Innovation Exchange. Change can appear to be happening slowly; however, as illustrated by the “100th monkey6” phenomenon, it can also be quick and transformative when an innovation that meets a genuine need is seeded in the matrix of collective thought. Additionally, the vision statement, acting as a guiding principal, aligns all major corporate initiatives (fiscal and social) and allows stakeholders to more easily align their vision with the company’s. 3. Enhancing quality of life through engagement in one’s work. Having conducted a small-scale experiment with some aspects of Stakeholder Enrichment at the Team level in 2011, an application at the departmental level will provide an opportunity to explore the theories and measure results on a larger scale. An internal or University study could measure the impact of the Stakeholder Enrichment process on employee engagement and customer satisfaction. Any individual, Team or Company intrigued by this process can begin by creating a Stakeholder Enrichment vision statement. Developing a higher purpose project giving tangible form to their vision and enabling stakeholders to engage in a unifying vision may be the next step. Alternatively, a Team could begin with the process of “bottom-up” engagement by researching, discussing and defining what enrichment and engagement mean to them and brainstorming ways to improve the quality of life by taking personal action to improve their jobs. We are in a time of transformation. Many individuals are struggling to survive economically, yet as a species, we display the desire to find meaning, purpose and fulfillment in our lives and our work. As more people, and organizations, move beyond survival and are motivated by quality of life that includes a sense of meaning and purpose in the workplace, perhaps our organizations and economic systems will evolve along with us. As we individuals, (i.e. cells within the corporate body), expand our definitions of assets, liabilities and net worth, our corporate cultures and economic system will evolve along with us. Enrich- Evolve –Excel. Although the views and opinions expressed in this hack do not reflect anyone’s but my own, I owe a debt of gratitude to Northern Trust and special thanks to the members of the Insurance Team (“Leaders in Innovation and Engagement”) in the Client Accounting Practice (CAP). The supportive leaders and managers in CAP, Human Resources, Corporate Social Responsibility and throughout the Bank have created a very engaging and enriching environment. My team mates are responsible for bringing my initial ideas for an engagement project to life and for the success of our work together in 2011. It is a pleasure and privilege working with each of them and all of the Northern Trust partners. In this day and age of negative press about financial institutions, I am happy to report that Northern Trust has a culture of sincerely caring for all of its stakeholders. Detailed acknowledgements are at the end of Appendix A. Also, special thanks to Marcia Wieder, Founder of the Million Dreams CampaignTM. As a member of the Founder’s Circle of MDC, I encourage everyone to check out the web-site and participate in the campaign. Her Dream UniversityTM workshops inspired the ongoing creation of my own big vision. Hats off for applying this game-changing approach to an industry that's taken a lot of heat lately. We (clients, investors, the public, employees) have experienced several hits to our trust in banking and finance. Stakeholder Enrichment is much-needed, focusing not on damage control, but rather on pioneering a new way of engaging all stakeholders for something much bigger and greater than what currently exists. You offer the corporate culture of banking and finance the potential to become leaders - drawing capitalism into a new sphere. Thanks for your encouraging comments. Much appreciated! In a culture where teamwork is so strongly emphasized, this approach allows the individual to feel as though their unique voice is heard. What I appreciate about the plan is that it enforces both a top-down and bottom-up responsibility for engagement and creativity. What was your technique/s for energizing the employees to participate in the process considering how demand for employee's energy continues to expand in our culture? Hi Rita, thanks for your comments and questions. You are right that demands on employee's time and energy are increasing, which is why engagement and innovation, are more important than ever. Enriched, or engaged employees, are capable of working smarter, not just harder. If an employee simply follows existing procedures and processes, the limit of their time and energy will be reached and result in a burned out employee with no work/life balance. Engaged employees are able to create and share process innovations which means that more can be done in less time. 1. Used StrengthFinder 2.0 assessment to create initial interest and combined results for a Team Matrix illustrating the depth and breadth of our talents. 2. Inspired the Team with the higher purpose of "leading from the bottom up" and translating the term engagement into language employees use. 3. Started brainstorming by asking the question "how can we make our jobs better?" 6. Created projects, as a team, to improve our jobs and fulfill our higher purpose. 7. Branded ourselves as "Leaders of innovation and engagement" which reinforces our purpose. In short, I think the process has three main steps: 1) inspire, 2) connect and 3) focus on a higher, common purpose. Also curious, is this Stakeholder Enrichment process an original concept of yours or are you applying a previously existing concept? I developed this over the last 1 1/2 years at the Team level and expanded the ideas for this M-Prize entry to apply to corporations and capitalism. Having applied aspects of this method in my personal life for many years, I can speak to its effectiveness in creating success and fulfillment for an individual. This is thought provoking and also practical. The 4 step process at the end of the summary was a quick "snapshot" of the hack - steps 2 and 4 are especially intriguing. The "Brief History of Work" attachment about employee engagement is very funny and so true. Your concept of Stakeholder Enrichment presents new ideas and combines existing ideas in a new way. The story within the hack is inspiring because the team successfully increased their own engagement levels. Thanks, Anne. I appreciate your comments. "Corporate Social Responsibility ratings could produce a single Stakeholder Enrichment metric that indicates the value added by an organization to all essential parts of the corporate “body”." What are the essential parts of the corporate body? How are they measured? It would seem an invigorating framework that allows all stakeholders, not just the inside, to influence and hold an organization accountable would need a clear, precise framework to inject stakeholder enrichment at every level. Hi Isaiah, thanks for your questions and comments! The essential parts of the "corporate body" are its stakeholders - investors, clients, employees, and community. Those stakeholders (as well as suppliers and regulators which are not address in this hack) make up the living system, or corporation (which comes from the latin root word for "body".